Liverpool striker Daniel Sturridge scored his first ever hat-trick as the Reds consigned Fulham to a fifth league defeat in a row. Dimitar Berbatov headed Fulham into the lead from Sascha Riether's cross, only for Sturridge to lash in an equaliser. The home side were denied a penalty for a Lucas Leiva handball before Sturridge slotted in his side's second. 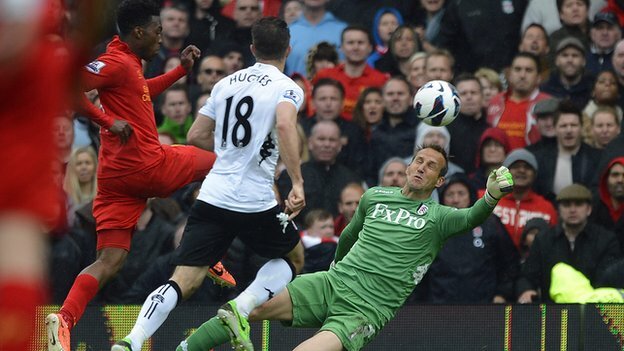 Liverpool were creating chances at will and Sturridge grabbed his third when he chipped over keeper Mark Schwarzer. 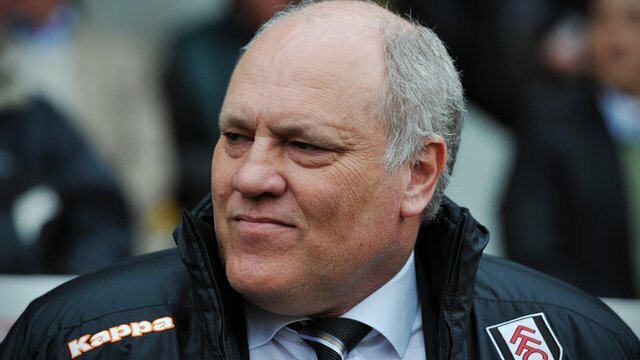 Fulham boss Martin Jol had a suitably concerned expression on his face at the final whistle after his side's capitulation left them with just one point from their last seven games. It is a run of results that means the Cottagers are still not mathematically safe from relegation, although it would take an unlikely set of scores for them to go down. They were easily undone here by a Liverpool side without two of their pivotal players, with midfielder Steven Gerrard injured and striker Luis Suarez suspended. The visitors began in enterprising fashion but Fulham gradually worked their way back into the match before taking the lead. "Liverpool are now unbeaten in their last seven games and on this sort of form might be contenders for a Champions League spot next season. Fulham, who started the season brightly, have fallen away badly and have relied too much on their player of the year Dimitar Berbatov." Damien Duff fed Riether and the German full-back crossed for the previously anonymous Berbatov to head in at the far post. Liverpool's response was almost immediate, as they took just three minutes to equalise. A long Andre Wisdom ball was gathered by Sturridge, who twisted and turned Aaron Hughes before bursting past the defender to lash a shot past keeper Schwarzer. The visitors made no further progress before half-time, however, and after the break the home side were furious that referee Mark Halsey failed to award them a penalty when a Bryan Ruiz cross struck the outstretched arm of Lucas Leiva. The decision rocked Fulham and Liverpool capitalised by immediately going up the other end and scoring. Philippe Coutinho slipped as he attempted a shot but his effort fell to Sturridge, who controlled and slotted past Schwarzer. Sturridge's hat-trick bid was initially thwarted by two superb Schwarzer saves, while Reds keeper Pepe Reina pulled off equally impressive saves to keep out a Berbatov shot and Aaron Hughes header. Jol : "We can't get these decisive winners"
But Liverpool were in rampant form, regularly opening up Fulham's defence, with Reds substitute Fabio Borini cutting inside and rattling the post with a well-struck shot. Schwarzer was doing his best to limit the damage but Sturridge's third finally arrived when he latched on to an incisive Coutinho pass before chipping the ball over the on-rushing keeper. "It should have been a penalty [for the Lucas Leiva handball]. "[The game] was frustrating. Normally if we score we win games. We never seem to win games after being down." "Daniel was outstanding. He scored three goals and he could have had maybe six. "If he keeps improving, keeps training well, then I think he will have an outstanding couple of years for us. "He's not perfect. He should have squared one when he was through. But he was looking for his hat-trick, he's a goalscorer, and to be greedy you've got to be good. He's an outstanding player." Full Time The final whistle is blown by the referee. Unfair challenge on Jamie Carragher by Dimitar Berbatov results in a free kick. Jamie Carragher restarts play with the free kick. 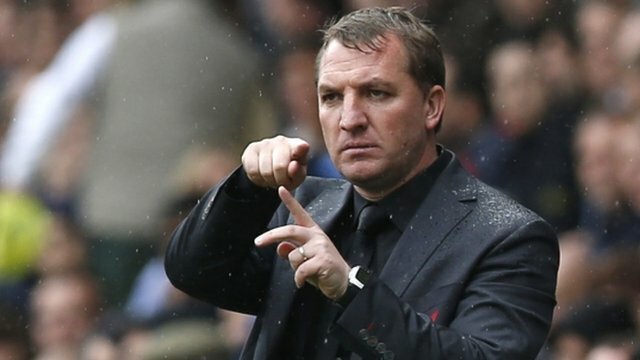 The assistant referee signals for offside against Fabio Borini. Aaron Hughes takes the free kick. Substitution Conor Coady on for Phillippe Coutinho. Assist on the goal came from Phillippe Coutinho. Goal! - Daniel Sturridge - Fulham 1 - 3 Liverpool A goal is scored by Daniel Sturridge from deep inside the penalty box to the top right corner of the goal. Fulham 1-3 Liverpool. Dimitar Berbatov fouled by Jordan Henderson, the ref awards a free kick. Direct strike on goal from the free kick comes in from John Arne Riise, fantastic save by Jose Reina. Substitution John Arne Riise is brought on as a substitute for Giorgos Karagounis. A cross is delivered by Phillippe Coutinho, Aaron Hughes manages to make a clearance. Stewart Downing takes the inswinging corner, Shot by Sanchez Jose Enrique from deep inside the penalty area misses to the right of the goal. Short corner worked by Stewart Downing. The official flags Phillippe Coutinho offside. Direct free kick taken by Giorgos Karagounis. Fabio Borini takes a shot. Save by Mark Schwarzer. Fabio Borini produces a right-footed shot from just inside the box and hits the post. Stewart Downing sends in a cross, Jordan Henderson conjures a left-footed shot from inside the six-yard box that clears the bar. Sanchez Jose Enrique crosses the ball, Aaron Hughes manages to make a clearance. Phillippe Coutinho takes a shot. Aaron Hughes gets a block in. Corner taken by Stewart Downing from the left by-line, Dimitar Berbatov manages to make a clearance. Substitution Fabio Borini joins the action as a substitute, replacing Jonjo Shelvey. Eyong Enoh produces a right-footed shot from just outside the penalty area that goes harmlessly over the target. Dimitar Berbatov takes a shot. Save made by Jose Reina. Corner taken left-footed by Bryan Ruiz from the right by-line, Aaron Hughes takes a shot. Jose Reina makes a save. Giorgos Karagounis takes the inswinging corner, clearance made by Jamie Carragher. Sebastian Coates concedes a free kick for a foul on Mladen Petric. Direct free kick taken by Bryan Ruiz. Jonjo Shelvey takes a shot. Save by Mark Schwarzer. Outswinging corner taken by Phillippe Coutinho from the left by-line played to the near post, clearance made by Sascha Riether. Substitution Mladen Petric is brought on as a substitute for Alex Kacaniklic. The ball is swung over by Jordan Henderson. Daniel Sturridge takes a shot. Save by Mark Schwarzer. Inswinging corner taken right-footed by Jonjo Shelvey played to the near post, Aaron Hughes manages to make a clearance. Sanchez Jose Enrique produces a cross, Brede Hangeland manages to make a clearance. Leiva Lucas gives away a free kick for an unfair challenge on Giorgos Karagounis. Giorgos Karagounis takes the direct free kick. Daniel Sturridge takes a shot. Mark Schwarzer makes a comfortable save. Phillippe Coutinho takes a shot. Giorgos Karagounis gets a block in. Phillippe Coutinho provided the assist for the goal. Goal! - Daniel Sturridge - Fulham 1 - 2 Liverpool Daniel Sturridge finds the back of the net with a goal from inside the penalty area to the bottom left corner of the goal. Fulham 1-2 Liverpool. Bryan Ruiz takes a shot. Jordan Henderson gets a block in. Corner from right by-line taken by Bryan Ruiz. The ball is delivered by Glen Johnson, clearance made by Aaron Hughes. Alex Kacaniklic has shot on goal from just outside the penalty box which goes wide of the right-hand upright. Giorgos Karagounis takes the free kick. Booking Glen Johnson receives a caution for unsporting behaviour. Glen Johnson gives away a free kick for an unfair challenge on Eyong Enoh. Stewart Downing takes a inswinging corner from the right by-line to the near post, Brede Hangeland makes a clearance. The ball is crossed by Sanchez Jose Enrique, Header from deep inside the penalty area by Daniel Sturridge goes harmlessly over the crossbar. Substitution Sanchez Jose Enrique replaces Andre Wisdom. Half Time It is the end of the first-half. Unfair challenge on Damien Duff by Phillippe Coutinho results in a free kick. Direct free kick taken by Giorgos Karagounis. The ball is crossed by Sascha Riether, Jamie Carragher makes a clearance. Dimitar Berbatov takes a shot. Sebastian Coates gets a block in. Inswinging corner taken from the right by-line by Bryan Ruiz. Giorgos Karagounis takes a shot. Blocked by Sebastian Coates. Free kick awarded for a foul by Jordan Henderson on Giorgos Karagounis. The free kick is swung in left-footed by Bryan Ruiz. Goal! - Daniel Sturridge - Fulham 1 - 1 Liverpool A goal is scored by Daniel Sturridge from close in to the top right corner of the goal. Fulham 1-1 Liverpool. Goal! - Dimitar Berbatov - Fulham 1 - 0 Liverpool Dimitar Berbatov gets on the score sheet with a goal from inside the six-yard box to the bottom left corner of the goal. Fulham 1-0 Liverpool. Stewart Downing produces a cross, clearance by Brede Hangeland. Stewart Downing challenges Damien Duff unfairly and gives away a free kick. Bryan Ruiz delivers the ball from the free kick left-footed from right channel, Leiva Lucas manages to make a clearance. Eyong Enoh has an effort at goal from 25 yards. Save by Jose Reina. Sascha Riether challenges Daniel Sturridge unfairly and gives away a free kick. Phillippe Coutinho takes the direct free kick. Effort on goal by Jordan Henderson from long range goes harmlessly over the bar. The referee blows for offside. Jose Reina restarts play with the free kick. The ball is sent over by Giorgos Karagounis, Glen Johnson manages to make a clearance. Unfair challenge on Bryan Ruiz by Leiva Lucas results in a free kick. Bryan Ruiz restarts play with the free kick. Daniel Sturridge takes a shot. The ball is delivered by Alex Kacaniklic. Centre by Glen Johnson, comfortable save by Mark Schwarzer. The ball is swung over by Alex Kacaniklic, Sebastian Coates gets a block in. Corner taken by Giorgos Karagounis from the left by-line, clearance made by Andre Wisdom. Inswinging corner taken left-footed by Stewart Downing from the right by-line. Substitution Urby Emanuelson comes on in place of Kieran Richardson. Phillippe Coutinho takes a shot. Save by Mark Schwarzer. Daniel Sturridge delivers the ball, Stewart Downing takes a shot. Damien Duff gets a block in. Jordan Henderson challenges Kieran Richardson unfairly and gives away a free kick. The free kick is swung in right-footed by Giorgos Karagounis. Outswinging corner taken by Jonjo Shelvey. Dimitar Berbatov is caught offside. Indirect free kick taken by Jamie Carragher. Jonjo Shelvey takes a shot. Blocked by Brede Hangeland. Jordan Henderson produces a cross, Daniel Sturridge takes a shot. Save by Jose Reina. Damien Duff delivers the ball, save made by Jose Reina. Inswinging corner taken from the right by-line by Damien Duff, comfortable save by Jose Reina. Corner taken left-footed by Damien Duff to the near post, Jonjo Shelvey makes a clearance. Unfair challenge on Alex Kacaniklic by Jordan Henderson results in a free kick. Direct free kick taken by Kieran Richardson. Which counties want Kevin Pietersen? Watch video Are Liverpool back on track?